Recently, Tips & Toes has launched their Red carpet nail Polish Collection which consists of 23 exciting nail polish shades out of which, there are some gel nail polish, textured polishes and some Nail Art Top coats. I got these two bottles. One is a stunningly pretty top coat and another is my favorite Corally pink gel nail paint. 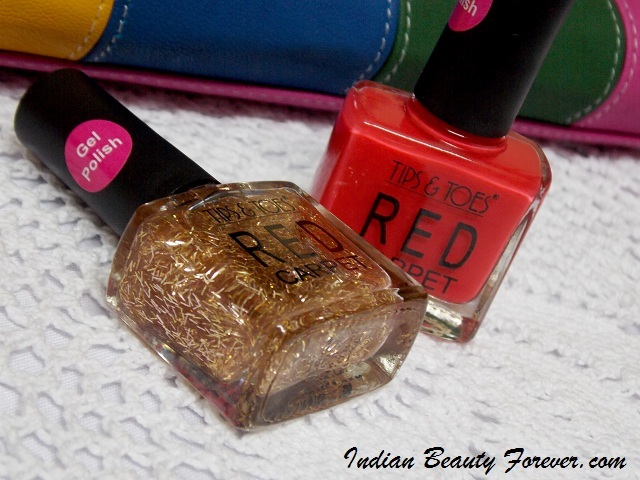 Price:These nail polishes are priced at 225 rupees per bottle and it contains 9 ml. The bottles are square with black handle cap and flattened brush that helps apply really nicely. I like medium sized brush as they can work for every nail type. As in if someone has smaller nail then if the nail polish has a broad brush then while applying it would coat the nearby skin as well. Packaging and brush wise they are good and I like them! Out of the 23 shades, 8 of them are gel nail polish. I have this shade Royal wine here and I must say this is my favorite not only from this brand but in general, I had around 5 similar looking colors from different brands. In fact, I have seen such corally pink and some similar shades flaunted by a lot of celebrities. It is just gorgeous on your nails! This Royal Wine shade is decently pigmented. On its first coat, you can expect a pale looking color that would be translucent enough to let the nail peeking through but as you apply the second coat, it becomes intense.I have applied 3 coats in the pictures and loved the flawless finish. I was thinking that being a gel nail polish it will take a lot of time to get dry but it dried pretty quickly. The finish is glossy and smooth. When I had only the first coat, it chipped off with a day really badly, but when I had 3 coats, it did fairly well and did not chip for at least 2 days which was strange and impressive if compared with the first experience with the product! Even if it will not chip off if you will scratch from the edges it will get peeled off. I think priced is okay for a gel nail paint but still I wish it could have been lower. If you like the color or any of the other lovely shades from this Red carpet nail polish range. Then go ahead! I have used gel based top coats earlier as well and love them. They can beautify your manicure within minutes at home and give a professionally done kind of finish. I got this Burnished Russet. Quite an interesting name it is!! Now, before I say anything did you see how fascinating this nail polish is. Fine golden strips suspended in a gel base. Absolutely stunning. 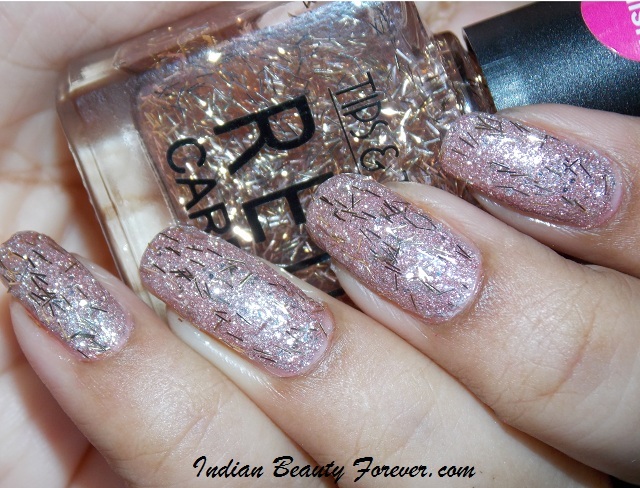 This nail polish can be worn on its own for just a subtle hint of glam and glitters on your nails or over any color. Since the strips are gold it will compliments all the nail polish shades. I LOVE this color. But the only thing that I want to point out is that it’s a gel polish so, you have to give it sufficient time to get dried else the poor thing can come off, if it gets rubbed against something. Unlike the regular nail polishes, it needs some extra time to compose itself and give you that professionally done manicure. It stays a lot longer on the nail and up to 5 days. On my nails I ave used it over a glittery color which was my base coat to make the manicure full of glitter loaded. Lastly, I have liked both the colors and texture. The gel polish has a smooth glossy finish with a decent build able pigmentation whereas the top coat is a flattering gel based polish to adorn your nails at home. 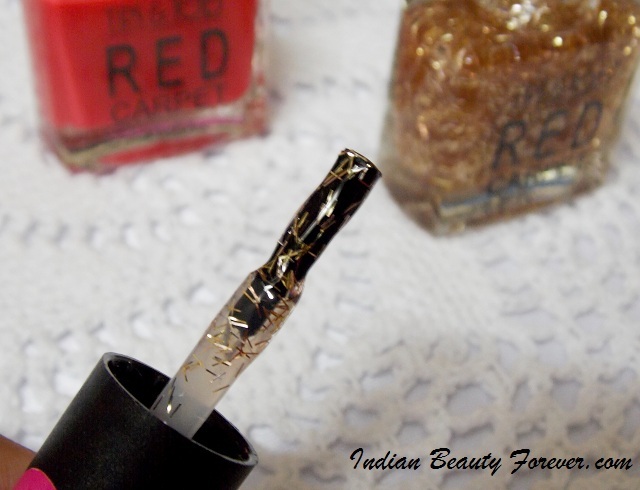 Gel nailpolishes for just Rs225? Awesome! Burnished Russet is so unique! I loved that. it is a really gorgeous top coat! 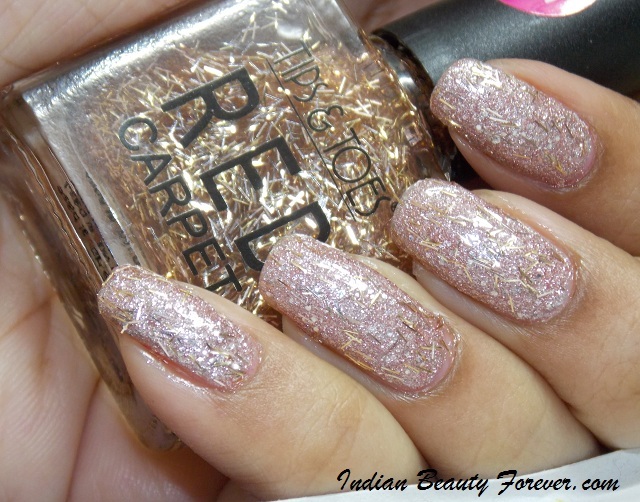 Both are super gorgeous Niesha and look lovely on your nails. I was wondering how beautiful would Red Carpet look on top of Royal Wine. Would it then need a LOT of time to dry... gel over gel nailpaint? I used to think Tips and Toes is just a regular affordable brand but seems they are now targeting higher and coming up with better products. Thank you so much Gagan!! :) Royal wine and Burnished combi will look great. Even I wish that the price could have been a little lesser but as you said may be they would like to target more people. Niesha you have such gorgeous long nails. And these are nice stuff, looks pretty amazing on you. Thank you Richa! :) They launched these recently Do try the top coats they are beautiful. Very pretty shades n grgs nails ..
How r u niesha ?? I love the one with the gold flakes! What a fun way to add some shimmer. I agree Shannon! It is pretty! 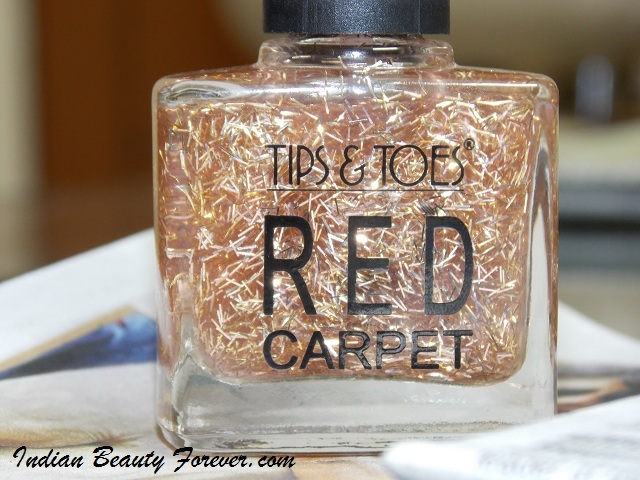 Love the soft red on you, that fuzzy looking topcoat looks great the way to use it too! I'm not one who goes fancy with nails! tip and toes do have some promising product right? Thank you dear! :) They are coming up with good products. Burnished Russet is such a pretty one Niesha...!! Lovely is the word ! u have perfect nails Nieshu <3 Loved both the shades! I find them pricey too but shades r pretty! where can i order dese?? I haven't seen them online yet! May be you can try nearby store.